Click here for a FREE online estimate right now! Growing up near Fort Lewis and McChord Air Force Base (now Joint Base Lewis-McChord or JBLM), we have always been among one of the largest military communites in the nation. We have friends and even family members who serve, or have served in the military. So, we have come to appreciate first-hand what each military member and their family sacrifices for the pursuit of our freedom. In an effort to show our appreciation to our brave soldiers, we offer every active and retired military member and their immediate families, an exclusive discount off of our cleaning services. 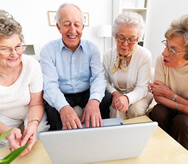 If you're 55 or older, you qualify for our senior discount! This is an on-going discount that you can receive again and again. All we need from you is a quick peek at your I.D. Earn $20 of FREE Cleaning For Referring Someone! No other carpet cleaner in Dupont, WA makes it so easy to save money! Get $25 of FREE Cleaning When You Subscribe to Our Email Newsletter! "Friend", "Follow", "Like", "Subscribe" and Interact With us Through Social Media!...AND SAVE MONEY! Save $1 on your service for EACH friend request, "like" or subscription to one of our many social media pages.  Tell Us How We Did And Get FREE Scotchgard Fabric Protector! We also appreciate your reviews on other sites like Yelp, Yahoo, SuperPages, and Angie's List. DISCLAIMER: The discounts above are subject to change without notice. We do our best to keep our websites up to date, however there is no guarantee. 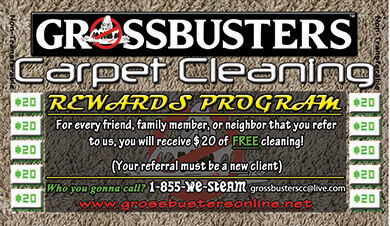 Military and senior discounts may be repeatedly used with Grossbusters Carpet Cleaning. Military and senior discounts are only combinable with our Rewards Program discounts, our social media discounts, and our free Scotchgard fabric protector offer. We will award you $20 of free cleaning for each client that you refer to us. The client must be new, and must schedule and PAY for a cleaning for your $20 credit to be issued. Please keep in mind that you may or may not receive a Rewards Program punchcard, based on whether or not we have them in stock. Regardless of whether you have one or not, we'll keep track of who you have referred to us. $20 credits and punchcards themselves are NOT transferrable. Subscription to our email newsletter entitles you to $25 off your next service. You must schedule a cleaning within 30 days of subscribing to qualify for the discount. A valid email address must be used. Please note that our minimum service charge must still be met. This offer is not cominable with military or senior discounts. For each 'subscription', 'like', 'follow', or 'friend request' to one of our social media pages, you will receive $1 off your service. You may only receive $1 off per 'like', 'follow' 'subscription', etc. Your corresponding social media page must be active and valid. Social media discounts CAN be used in conjunction with other discounts. Check back often for updates and seasonal discounts. We also have standing cleaning specials not listed on this page. Please call 1-855-937-8326 if you have any questions about our discounts.